Unidentifiable girl in black clothes and boots walks on a footway with small stairs in autumn away from camera towards apartment blocks and waves goodbye with a hand. Yellow leaves fall from trees. hd00:14Man Walking in the Autumn Park in Slow Motion on a Sunny Day. Colorful Foliage In The Autumn Park. Man Relaxing in Autumn Park. Fallen leaves in autumn forest at sunny weather. 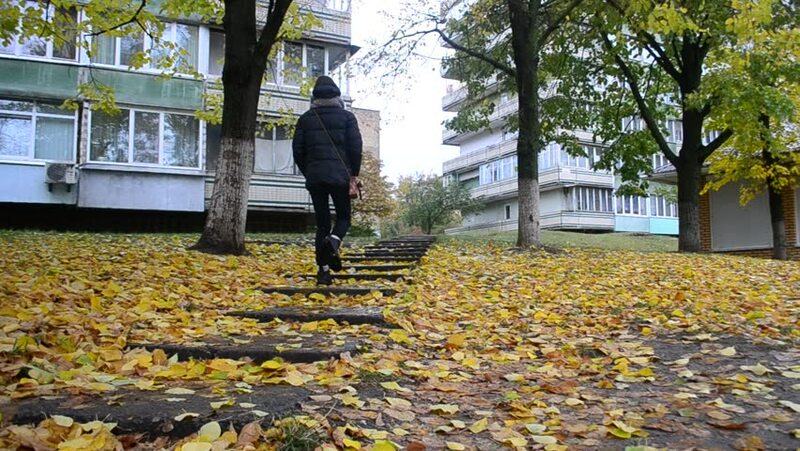 hd00:13Unidentifiable girl in black clothes and boots walks on a footway with small stairs in autumn away from camera towards apartment blocks. Yellow leaves fall from trees. 4k00:07A person shovels rocks out of a truck for use at a school in rural Kenya. hd00:18Gardener trimming hedge in green park with electric trimmer for hedge. Worker shaping bushy fence in the garden. Cutting shrub plant with trimmer in the backyard. Man on maintain green areas. 30 fps.